Welcome to part two of our wonderful out west adventure. 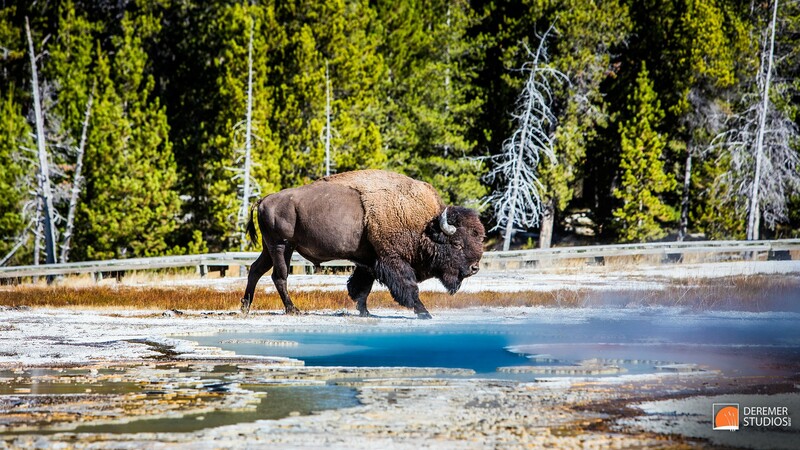 Today, we’re featuring the two days we spent exploring the southern portion of Yellowstone National Park. After spending two nights at Mammoth Hotel (one night in the hotel, one night in a rustic cabin) we headed South. Our route took us east, through Tower Junction, and then south, to Canyon, West to Madison Junction, and finally south again to Old Faithful Inn (below), where we had the great privileged of staying for two nights. While in the southwestern portion of the park, we explored a myriad of geysers, hot springs and thermal features in and along the Firehole River. Wildlife was fewer and less diverse in this area, though winter apparently brings many species south to the thermal-heated landscape. We did see some lone Bison, like the big bull above, as well as a smallish herd near Midway Geyser Basin, but that was about it. However, the geothermal features proved nearly as interesting as the wildlife, at least to Bryn and I. 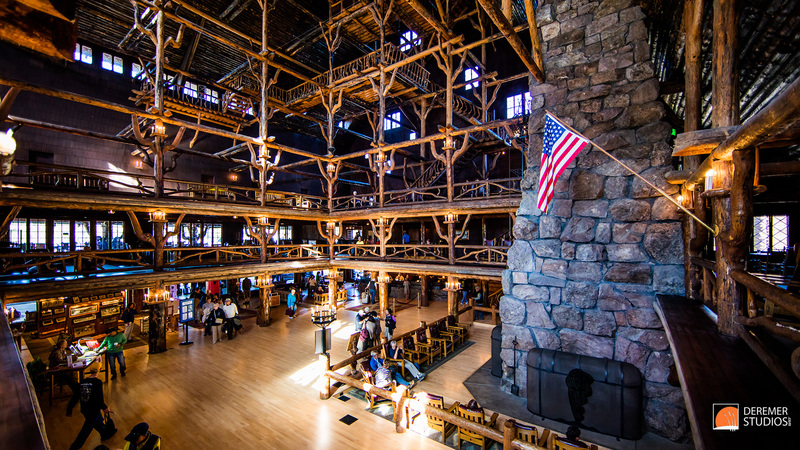 So, a little more about Old Faithful Inn. The inn was built over the course of one year – 1903 – by just a little over 50 men. The great hall (above) stands 78 feet tall to mimic the height of the surrounding evergreen forest, and is topped with an honest to goodness tree house – a bit of whimsy the then 29 year old architect Robert Reamer added to the massive interior. The hotel was built out of locally sourced wood and stone – quarried and cut within a 5 mile perimeter of the hotel. Our room was in part of the original hotel (called the old house) – room #51 – in a cozy little corner on the first floor overlooking the front entry. Now, as you can see from the image in the gallery below, the historically accurate drapes may have left a little bit to be desired, but I have to say they were better at masking what was inside than I feared. Overall, the historic room was truly wonderful, with all the modern comforts we needed, but with all the time-traveling charm of life in a grand Victorian hotel. We also tried our hand at a bit of astrophotography – our first was foray spent with Old Faithful during a cloudless night with a nearly quarter, waxing crescent moon. Even with the brightness of the moon, the amount of stars we could see after just a few minutes outside was stunning. I didn’t realize just how much light pollution we have in FL – It’s been a long time since I’ve seen the Milky Way with my naked eye! So, we setup our shot while waiting for the big event (about 90 minutes apart) and we were ready when the geyser erupted. Above is our favorite shot from the show. All in all, Yellowstone was an amazing experience! Next up, Grand Teton National Park! 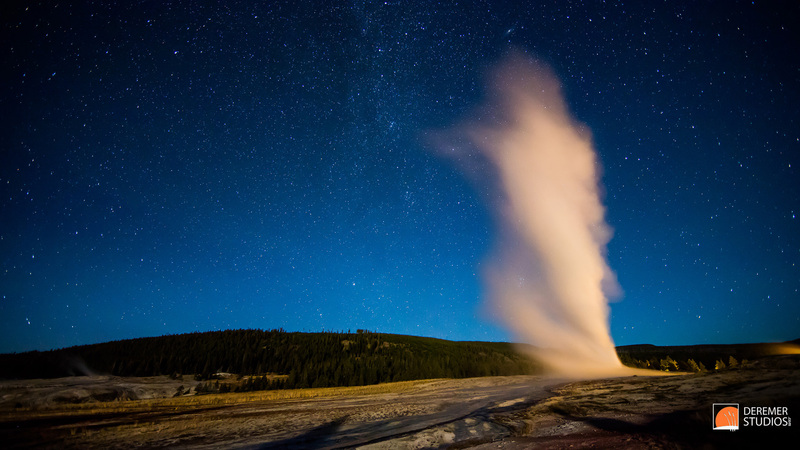 This entry was posted in Fine Art Photography and tagged Astrophotography, bison, Deremer Studios, fine art, geyser, HD Wallpaper, inn, Jacksonville, national park, old faithful, Photography, sunset, travel, yellowstone.